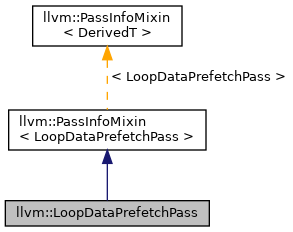 An optimization pass inserting data prefetches in loops. Definition at line 22 of file LoopDataPrefetch.h. Definition at line 156 of file LoopDataPrefetch.cpp. References llvm::abs(), llvm::PreservedAnalyses::all(), llvm::CodeMetrics::analyzeBasicBlock(), assert(), llvm::LoopBase< BlockT, LoopT >::blocks(), llvm::CodeMetrics::collectEphemeralValues(), llvm::IRBuilder< T, Inserter >::CreateCall(), llvm::dbgs(), DEBUG_TYPE, llvm::df_begin(), llvm::df_end(), llvm::dyn_cast(), llvm::LoopBase< BlockT, LoopT >::empty(), F(), llvm::ConstantInt::get(), llvm::Intrinsic::getDeclaration(), llvm::LoopBase< BlockT, LoopT >::getHeader(), llvm::Type::getInt32Ty(), llvm::Type::getInt8PtrTy(), llvm::Function::getIntrinsicID(), llvm::Value::getName(), llvm::BasicBlock::getParent(), llvm::Type::getPointerAddressSpace(), llvm::AnalysisManager< IRUnitT, ExtraArgTs >::getResult(), llvm::SCEVAddRecExpr::getStepRecurrence(), llvm::SCEVNAryExpr::getType(), llvm::Value::getType(), I, llvm::Loop::isLoopInvariant(), llvm::isSafeToExpand(), llvm::AArch64CC::LE, LLVM_DEBUG, llvm::Instruction::mayReadFromMemory(), Metrics, llvm::CodeMetrics::NumInsts, llvm::X86II::PD, prefetch, PrefetchWrites, llvm::PreservedAnalyses::preserve(), and runOnFunction().